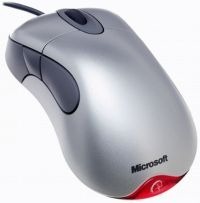 For some reason the Touch Mouse is not my first Microsoft mouse, although I’m quite a conservative if it’s about mice. I suppose I hadn’t more than four different mice in the last ten years now. Three of them were designed by Microsoft. (One was a Lenovo, but that doesn’t really count much. It came just with the machine and it fit perfectly to the keyboard – and that’s it). I guess it was in 2002 when I had my first Microsoft IntelliMouse. I reckon the mouse hadn’t the best design though. Actually it reminded me of the eighties, because of its bronze like color. It looked a bit like those mirrored windows they had at the GDR border control back then. And, that mouse was big. I mean really big, maybe it was influenced by those creepy trackball things, some people used in the nineties and around 2000. But anyway, it had a laser. A frickin laser. The days of cleaning balls and sensors in old ball driven mice were counted. The funny thing I mentioned was, if you started to clean those sensors, things got even worse. As if the ball and the sensors got statically charged and seconds later your mouse pointer was hoping again, because the sensors were full of dust. It’s rather fascinating that we actually got things done in those days. All my work mates had this mouse. But, unfortunately the first generation had a bug and the wire broke at the connector of almost every mouse I know. Too bad, because that hold back many of my work mates to invest in the second generation of the IntelliMouse. To be honest, I had absolutely no problem buying this one. And yes, my first IntelliMouse died the same wired death like the others. But man, the design of the second generation was way too good! I loved this mouse. The white body made a perfect contrast against the silver buttons. The shape of the body fits perfectly in my hand. The mouse seems to be just perfect. The mouse and I had a wonderful relationship over seven years in a row. I took my mouse always with me to almost all places. And that, in the end, was the reason why our relationship found an epic end. Like Smeagol lost his ring in the dungeons, I lost my most beloved mouse in whatever hotel. 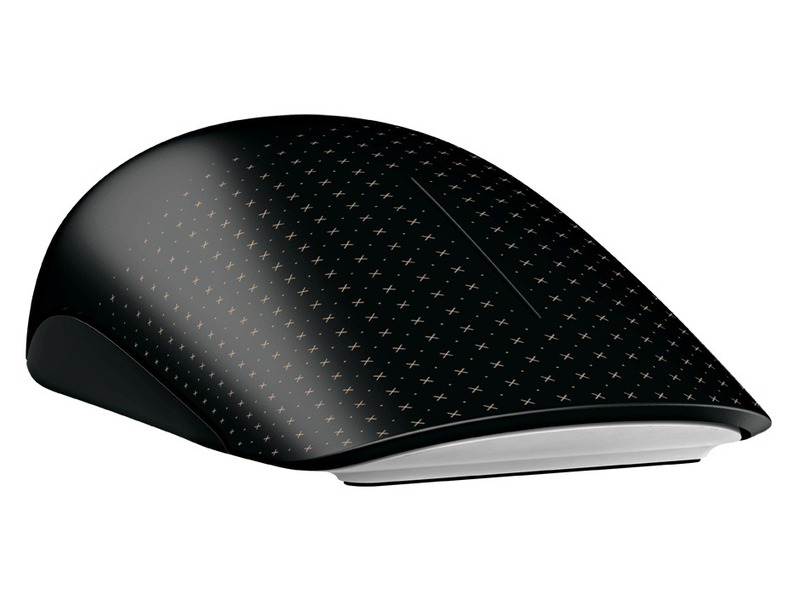 So, now it’s the Microsoft Windows 7 Touch Mouse. First impression – Obviously it’s a wireless mouse. But, wow, what’s that? It supports gestures from one, two and even three fingers. Apple, did you hear that? Heads off, Microsoft – Next stop on your roadmap must be the Touchpad! Take a look at that beauty? Isn’t that a cute kind of a mouse? All black, with little grey dots (actually little crosses) indicating an area where to click. There is no button to click, by the way. 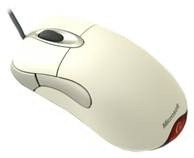 Where the Intelli Mice had four buttons and even a mouse wheel that was clickable, this one has just one big button. The whole surface itself is the button. The gestures are easy to learn and right after the installation starts a nicely designed gesture training application that teaches you everything you need. That was quite a cool experience actually, just plugging in the USB connector and swish the driver download starts and the training app starts. A good feature is three-fingers-up gesture what gives you another way to switch between open applications and windows. I’m quite happy and excited about my new mouse. I keep this secret, but I’m thinking about to by a second. I know I’ll need a second in the office. The purpose of my post today is to walk you through the installation of DSMI from scratch. I try to capture all necessary steps you would to setup a new server or to move your existing server from one machine to the other. Maybe, I have to ask me why I haven’t written this article earlier. To be honest, there were many different approaches of documentation in a variety of ways, from classic Word docs to even videos. But, in the end, the main problem did not change. The installation was simply to complex. To reduce the complexity we first put more logic into the installation. While the installation you are now only asked for the SQL Server connection details (and you don’t even have to change them) and the certificate’s common name. Our second approach for a better installation experience was to give you a command line tool that can check your current system configuration and make recommendations what to change, for instance activate Auto Login or set specific ACLs for paths in the file system. This tool is also easy extendable by us, so that we can customize it anytime to react to changes in the installation or requirements. But now it’s time to install a DirectSmile Integration Server. Before we can run the DSMI installation file, we have to prepare the operating system. By the way, we are talking about the 64Bit Standard Edition of Windows 2008 Server (R2) here. The DSMI installation is a single Microsoft Installation *.msi file. You have to run the installation in elevated trust mode. I presume that you have User Access Control (UAC) activated on your system. In this case open an elevated command line shell and change the directory to where your installation file is located. Type in: msiexec /i dsmi-x.x.x.x.msi (replace x.x.x.x by the current DSMI version number) to run the installation in trusted mode. 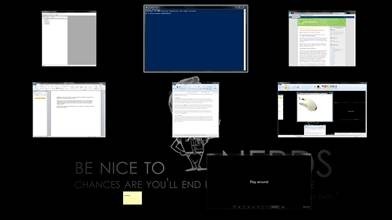 I guess we don’t need any screenshots of the installation wizard showing you how to hit next. Although, there are two pages that might be interesting for you. On the SQL Server credentials page you can configure the server and instance name. It’s not necessary that the DSMI database is located on the same server as the DSMI application. Further, you can set a username and password for SQL Server authentication. If you leave those fields empty the DSMI installation assumes that you use Windows Authentication later on to connect to the SQL Server instance. Have in mind that the DSMI frontend IIS application uses the NETWORK SERVICE account and the DSMI backend uses typically the SYSTEM account. Both accounts will be preconfigured to have the appropriate privileges in SQL Server by the installer. If you plan to locate the SQL Server on a different machine, you need SQL Authentication, because the NETWORK SERVICE and the SYSTEM account are local machine accounts. You will also be asked for the common name (CN) of your web server certificate. Usually the common name is the domain name the certificate is created for. If you are through with the main installation and everything went well, you now can go to customize your installation. The DSMI backend and frontend need access to different paths in the file system, to messages queues and the database. While some of those settings are preconfigured by the installation others aren’t. The precheck tool will go through all necessary settings and report what you have to change to ensure that DSMI can run correct. Auto logon Parts of DSMI run in a user session. It’s necessary to assign a specific windows user that has the DirectSmile WatchDog in the startup directory. This user account must automatically logon when Windows is starting. Certificate Checks if a webserver certificate is present. 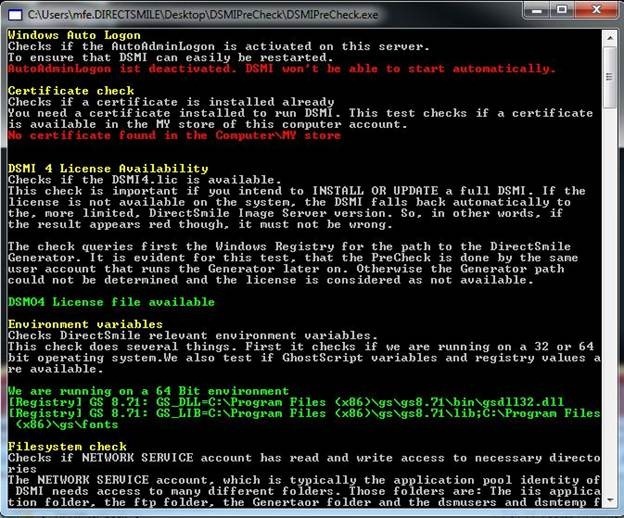 DSMI License Checks if DSMI is running in either full or image server mode. File System Checks if the IIS app pool user has the appropriate privileges to access all necessary files and directories in the file system. Message Queues Checks if DSMI message queues are created and accessible by DSMI. SQL Server Checks if the SQL Server instance is accessible. VM Checks if DSMI is installed in a virtual environment. The Precheck tool also create a report called report.xml and stores it in the Precheck’s application folder. This file can be helpful to our support. When we successfully logged on we go to the settings section of DSMI. Here we have to configure the Base URL to point to the domain name our certificate is assigned to. When this is done, we only have to setup the image repository path. That’s the directory where the rendered images and documents are stored in. The default path is c:\dsmtemp (or http://localhost/dsmimages for the IIS virtual directory) , you might want to change this to a different drive or location. Important is, that you reflect this in your IIS settings as well. This folder must be exposed as a virtual directory in IIS to allow users to access the rendered images over the internet, so you need to change always both, the absolute path in the file system and the virtual directory in the DSMI settings and the IIS. You now have installed and configured your DSMI. You can now test it. The easiest way to test it would be to upload a DirectSmile Set and/or DirectSmile Document and open the items browser in DSMI and hit the test button.